$105,953 - Price Shown Is MSRP For Base Model Without Options or Trailer. Please Call Today for SALE PRICE on boat as shown. Call Us Today - (269) 792-8080 For More Information and to Set Up an Appointment to View the Nautique GS20 Inside of our Indoor Showroom! Wake Package (Integrated 1850 Pound Ballast System, Nautique Surf System with WAVEPLATE), Configurable Running Surface with Hydro-Plate, Surf Pipe Exhaust, Zero Off GPS Speed Control. (2) 8.8 JL Audio M Series Speakers, Tower Speaker Prep Kit – JL Audio M Series Elite (Pre-Wired 4 Channel Amp), Nautique LINC PANORAY with Helm Control, Navigation and Docking Light Array, LED Courtesy Lighting. Flight Control Tower with Rotating Wakeboard/Wakesurf Racks, Retractable Ski Pylon, Surf Pipe Exhaust. Towable/Mooring Cover with Anti-Pooling System, Custom Built BoatMate Tandem Axle Trailer. 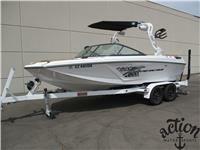 I am interested in your 2019 Nautique GS20 Ski/Wakeboard/Surf/Tow Boat and would like more information. Please let me know. Thank you!